Cut thighs into thin strips. Cook chicken, onions, peppers and tomatoes until chicken is no longer pink. Sprinkle taco seasoning over mixture and stir to coat. Place a tortilla in skillet. 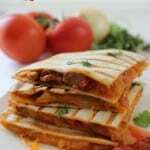 Top tortilla with meat and vegetable mixture and sprinkle cheese liberally over the op. Place a smaller skillet on top to gently press down. Allow to cook for 2-3 minutes or until bottom is starting to brown. Remove skillet and flip. Replace smaller skillet and cook for 2-3 more minutes or until that side is lightly browned. Remove to another plate and cook remaining quesadillas in similar manner.